For a short label introduction, click here. George Curry also had a secular release on Elko (#827). 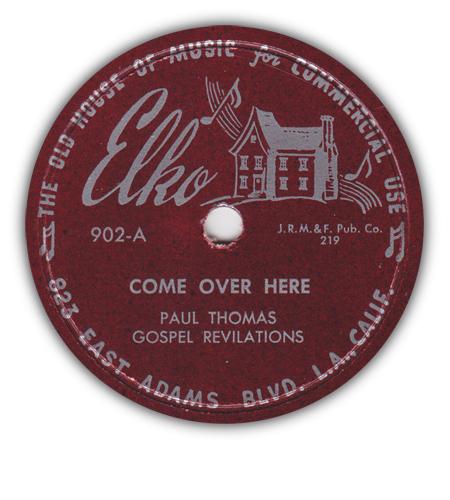 It seems likely that records #12 and #13 in the listing are both by the Corinthian Gospel Singers; however, on Elko 932 there’s no artist name given and there seem to be differences between the recordings. Elko 918, though credited to Sister Christine, is actually by Clara Ward/Clara Ward and the Ward Sisters. The same recordings can be found on BBS 1002, which was released in c. 1952. The Sensational Clouds of Joy continued to record as the Mighty Clouds of Joy (most famous for their Peacock recordings). This page lists all known Elko gospel releases. 3 Elko 254 Turney and her Goodwill Singers, Bertha Mae What Manner Of Man Is This b/w Didn’t It Rain 195? 12 Elko 932 Unknown group (Corinthians Gospel Singers?) Please Let Me Rest b/w Didn't It Rain 1954? 13 Elko (nn) Corinthians Gospel Singers Please Let Me Rest b/w Didn't It Rain 1954? 14 Elko (nn) Sensational Clouds of Joy Build Me A Cabin In Glory b/w That's What He Is To Me 195? 15 Elko (nn) Unknown group Let Me Live In Jesus' Name b/w My Lord Is Gonna Decide 19? ?